Mycorrhizal fungi are integrated components of sustainable ecosystem with the ectomycorrhizal (ECM) and arbuscular mycorrhizal (AM) fungi being the two most prominent and ecologically crucial mutualistic associations in terrestrial habitats. Areas for new plantations and minesites are often characterised with absence or low diversity, and/or incompatibility of mycorrhizal inoculants in the soil, which is considered as an essential constraint limiting the establishment of plantations and vegetation. The introduction of effective mycorrhizal fungi to the new sites is recommended along with the plant species involved in plantation and revegetation programmes. Inoculation of seedlings in plantation nursery is logistically feasible. Currently, many nurseries preferably use spore inoculants of ECM fungi although several different kinds of inoculants are adopted in forest practices. 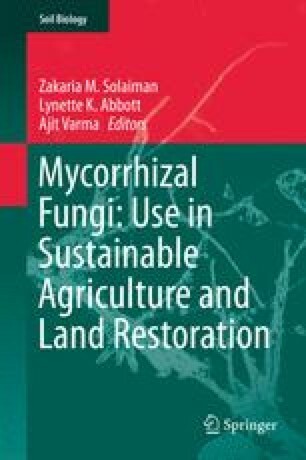 This chapter presents an overview of the development and application of mycorrhizal technology for forest plantations and minesite rehabilitation. Sources of inoculants, mycorrhizal formation, host specificity and inoculation effectiveness are discussed. Y.L.C. appreciates Professor Bernard Dell, Professor Lyn Abbott, Dr. Nick Malajczuk, Dr. Mark Brundrett, Dr. Chris Walker and Dr. François Le Tacon for their support and long-term collaboration. This study was financially supported by National Natural Science Foundation of China (31471946), International Foundation for Science (D-2894/1 & D-2894/2), Australian Centre for International Agricultural Research (F/9425) and International Tropical Timber Organization (PD 38/98 Rev.2(F)). The Australian Department of Education, Employment and Workplace Relations, Murdoch University and Chinese Academy of Forestry are acknowledged for granting scholarships and travel funds for a part of this study.